The Husqvarna Svartpilen 401 has been snapped testing in a camouflaged state, pics courtesy of Motohive. A report last week suggested that Bajaj Auto will launch the Husqvarna Vitpilen 401 and Svartpilen 401 in India in FY2019-20. The Husqvarna Svartpilen 401 test mule features alloy wheels and engine belly cover from the KTM 390 Duke, while the engine casings feature KTM branding. 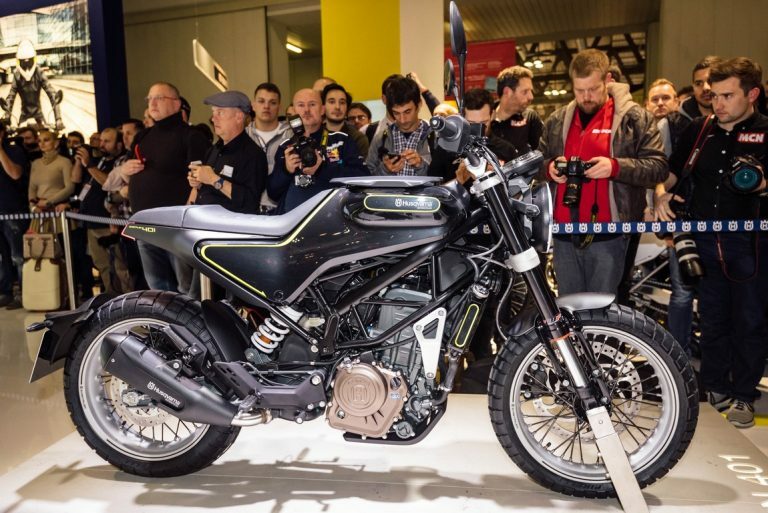 The Husqvarna Svartpilen 401 test mule seems to be an early prototype as the bike uses the KTM 390 Duke's wheels, and engine belly cover, while it bears KTM branding on the engine. That said, the test mule features the Pirelli Scorpion Rally STR tires at front and back and the precisely similar bodywork. The Svartpilen 401 is based on the KTM 390 Duke platform and is a modern day rendition of a neo-classic scrambler. 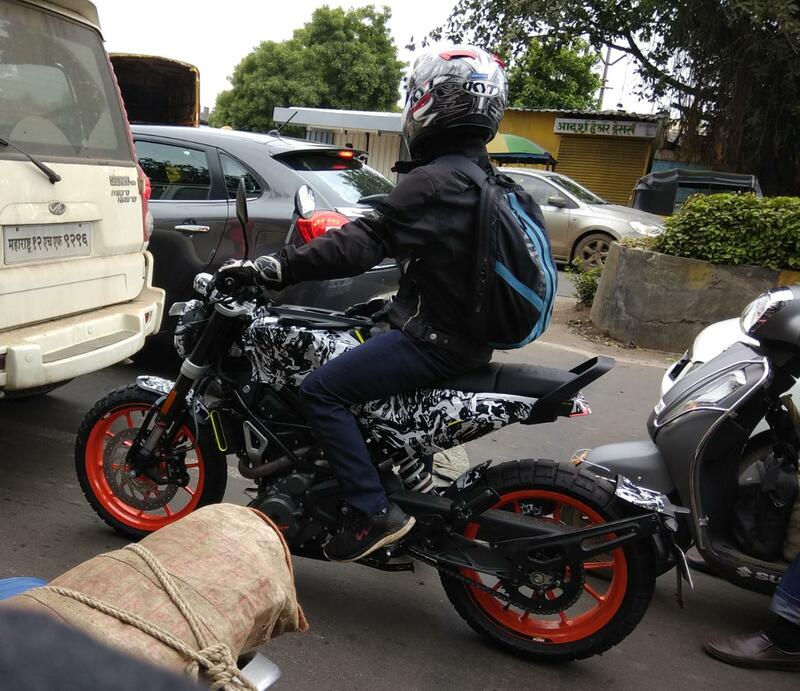 The is the first time the motorcycle is spotted in India with camouflage. We reported on 27 June that Bajaj-KTM would shift the production of the Husqvarna 401 twins to Bajaj Auto’s Chakan plant by early 2019. That said, KTM currently manufactures the 401 twins at its Mattighofen factory in Austria, since October 2017. According to S Ravikumar, Bajaj Auto’s President (Business Development), the company expects the Husqvarna 401s to overshadow the KTM 390 Duke and RC 390 in India. In the next phase, Bajaj-KTM plans to manufacture 2 lakh units per year in India. The Husqvarna Svartpilen 401 features minimalist styling with a bodywork that extends from the fuel tank to the tail section. The motorcycle gets round LED headlamps, upright seating posture, wide handlebar, and knobby tires. The Svartpilen 401 comes with a compact all-digital instrument cluster, and minimalist fenders. The motorcycle features a rear grab rail and a tire hugger with indicators and number plate holder. The Husqvarna Svartpilen 401 employs the 373.2 cc, single-cylinder, liquid-cooled motor that powers the KTM 390 Duke and the RC 390. The fuel-injected engine is capable of producing 43 bhp of maximum power along with a peak torque of 37 Nm, while it is mated to a 6-speed transmission with an anti-hopping slipper clutch as standard. Unlike the test mule, the production Svartpilen 401 features 17-inch wire-spoke wheels with tube tires. The motorcycle comes with LED lightings all around, rider by wire throttle, USD front forks, and an adjustable rear mono-shock. The Husqvarna Svartpilen 401 features minimalist styling with round headlamp, flat seat and wide handlebar. Anchorage comes from 320 mm front rotor and 230 mm rear disc brakes with radial mounted callipers and standard switchable dual-channel ABS. KTM will position the Husqvarna 401s as niche offerings above the 390 Duke and are likely to cost around INR 2.60 lakh (ex-showroom) in India.